The TGB was a twin-engined 47 foot, Watson class, non-self-righting lifeboat built by JS White of Cowes at a cost of £35,000 in 1962. In her 7 years of service coxswain Dan Kirkpatrick and his crew had several dramatic rescues which earned them medals of bravery. One of these dramatic rescues was of the Aberdeen trawler Ben Barvas which got into difficulties and came ashore on the Pentland Skerries on Jan 3rd 1964. The rescue was a 6 hour ordeal undertaken in very heavy seas with the added problem of a fast tide creating heavy surf breaking on the skerries. All but 5 of the crew were rescued by breeches-buoy, as the conditions did not permit the lifeboat to get alongside the trawler, with the remaining 5 having been removed earlier by another trawler Ben Screel. It was during her rescue of the crew of Ross Puma in April 1968 that for the first time ever the crew were recovered using the ships own liferafts, since then this is a standard procedure for rescuing crew and passengers. The TGB unfortunately came to a very sad end as on 17th March 1969, when the lifeboat capsized while on service to the Liberian vessel 'Irene' and her entire crew of eight lost their lives.On the evening of the 17th of March 1969 at 7.29 pm, the Coastguard telephoned Jackie Groat (Hon Sec) to say that the Liberian registered, Greek owned ship SS Irene was in difficulties 21 miles East of Duncansby Head, later she was found to be to the South of Old Head South Ronaldsay. The Longhope Lifeboat TGB was launched from Brims at 8.00pm in a force 9 south-easterly gale which had been blowing for several days turning the Pentland Firth extremely rough, visibility was also reduced owing to heavy rain and snow showers. At 9.07pm the TGB radioed the Coastguard telling them that they were 1 mile east of Swona. 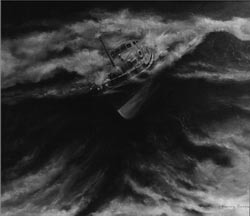 At 9.15pm the SS Irene was driven ashore by the south-easterly gale about ½ a mile from Grimness South Ronaldsay, the position was radioed to the TGB and was acknowledged at 9.28pm, that was to be the last message received from the Longhope Lifeboat TGB. Wick radio called the TGB at 10.10pm there was no reply, and so they repeated the message every five minutes. By this time the Irene was hard aground on the beach near Grimness and Coastguards had managed to save the entire crew of the stricken vessel with breeches- buoy from the land side. 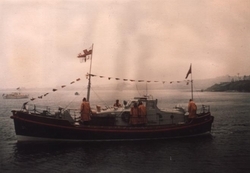 At 10.30pm there was still no reply from the TGB and the Coastguards started to fear the worst, the Kirkwall Lifeboat Grace Paterson Ritchie (a 70 ft Clyde) which was also on service to the SS Irene was asked to search an area from Grimness to 1 mile East of the Old Head, South Ronaldsay, they did so without success and had to seek shelter due to the sea conditions. At first light on the 18th of March a massive search was mounted, which involved the lifeboats from Kirkwall, Stronsay, Stromness and Thurso, with assistance of a helicopter from RAF Lossiemouth and a Shackelton aircraft from RAF Kinloss. At 1.40pm the Thurso Lifeboat found the TGB capsized 4 miles South West of Tor Ness point (Hoy), and proceeded to tow the upturned Longhope Lifeboat to Scrabster Harbour. Not one of the seven Lifeboat men onboard the TGB had survived, with the body of the eighth Lifeboat man (Assistant Mechanic James Swanson) missing. The coffins of the 7 Lifeboat men were carried back across the Pentland Firth to Longhope pier on the Kirkwall Lifeboat Grace Paterson Ritchie and on the 22nd of March 1969, after a service at Walls Old Church Longhope, the 7 Lifeboat men were laid to rest in Osmondwall church yard on the shores of Kirkhope looking out on the Pentland Firth. On the 9th of August 1970, HRH Queen Elizabeth the Queen Mother unveiled a memorial plaque in the Walls Old Church (now St Columbas) and a statue memorial of a cast bronze Lifeboat man looking out to sea, on a stone plinth, in Osmondwall church yard. A plaque on the plinth of the memorial carries the names of the 8 Lifeboat men who lost their lives on the Longhope Lifeboat TGB 17th March 1969:- Coxswain Dan Kirkpatrick, Second Coxswain Jimmy Johnston (son of Mechanic), Bowman Ray Kirkpatrick (son of Coxswain), Mechanic Robert R Johnston, Assistant Mechanic Jimmy Swanson, Lifeboat man Jack Kirkpatrick (son of Coxswain), Lifeboat man Robert Johnston (son of Mechanic), Eric McFadyen.